TOPAZ HORIZON: Prepare for tomorrow, live today! The scary typhoon yesterday really made me think about security. What about you? This is a sponsored post (thanks, Nuffnang and Philam Life!) but I'm going to confess some really personal things here. This post is going to be about money. And isn't that such a taboo topic? My regular readers know that I didn't come from a rich background. That made me work really very hard to become someone and earn more money than my parents ever did. I postponed marriage and motherhood because I just wanted to be secure financially before I ever took on such scary lifelong commitments. Vince always got upset by this fear of mine because, in his world, the men always were such good providers so I guess he considered my fear an affront to his capabilities. I did believe in him, I really did, and Vince has given me a life beyond my wildest dreams (thanks, Vince!!!) but I had deep-seated issues. I saw my mother work herself into exhaustion, suffer and get into serious debt. I saw relatives shunning us and making fun of her and my father. I heard neighbors say awful things about my parents. My parents are good people, kind and sweet and generous. But in this world, apparently that isn't good enough. You have to have money, too. When Mama died in 2008, it was very sudden. She had no savings so Vince and I, newlyweds at that time, emptied our bank accounts to give her a proper send off. When Papa suffered complications from diabetes and had to have two amputations last year, he also had no savings. Vince and I, new parents to a two-month-old Vito, again emptied our bank accounts to pay for his operations. The past few months have been terrifying for us, me especially, needless to say. But because Vince and I work so very hard, the money situation is good again. Still, when we look at Vito, happy and carefree, we promised ourselves that we will never let him feel the despair we both felt. We will provide not only for his future but for our future, too, so that Vito will never have to worry about his parents and he can be free to live the life he wants. That's why when Nuffnang invited me to a talk on financial planning, I immediately said yes. Philam Life has a new campaign called "Anong Plano Mo? Usap Tayo." Its aim is to make insurance easy to understand and not so scary. You see, people always think death and bad things when the word "insurance" is mentioned. I don't understand why that should scare people away actually. That should scare people into action! I'm so bewildered by people who refuse to prepare for the worst! Anyway, a couple of weeks ago, I went to the financial planning talk at Philam Life's super posh penthouse club at the Philam Life Tower in Makati. 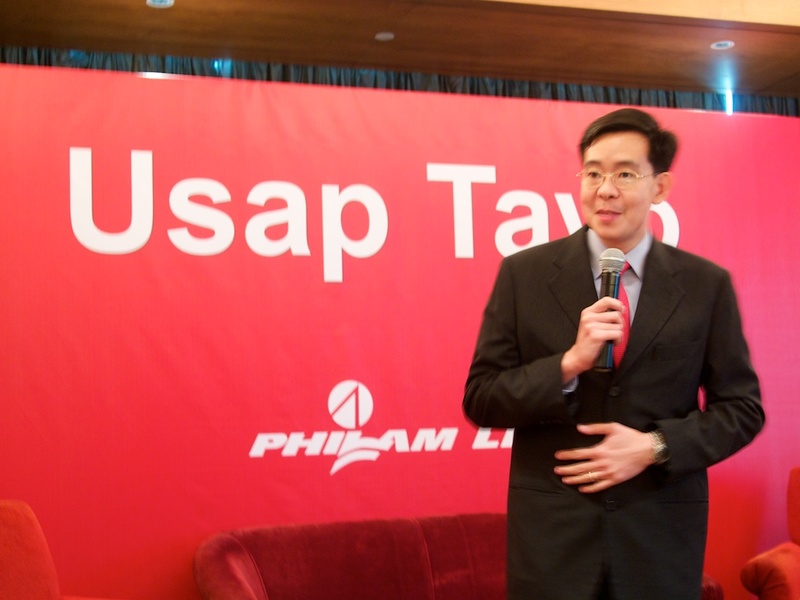 The talk was started by Larry Cleto, one of Philam Life's registered financial planners. Larry is a very good speaker, none of that annoying loud voice or sing-song manner. He talked to us like he was talking about the weather or traffic or the kids. You know, normal. He didn't hard sell, he didn't sound like a know-it-all. He made finances understandable and cool. He presented sobering facts about people's cavalier attitude towards money and their future. 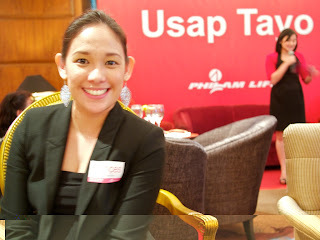 It was very "Usap Tayo" in a light and conversational way! 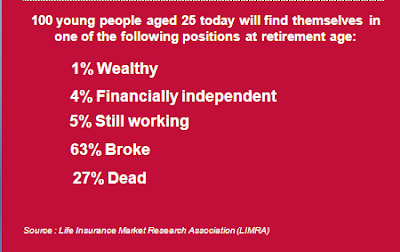 If you're 25 years old, that should scare you. I know 35 years from now seem like a thousand years away but believe me, it's not so far away. Vince and I bought insurance policies when I was 26 and he was 28. Eight years later, I got benefits for giving birth and Vince is enjoying endowment cash! So you see, insurance doesn't mean death and sadness! Larry also showed us how easy it is to save up for emergencies and retirement with as little as P1,000 a month. That's easy! That's like 10 Starbucks frapuccinos, right? I advise you to get policies now while you're young because the premiums will be cheaper than, say, when you're 40. One of Larry's slides was about the dreams of the typical Filipino. It really encouraged me because I am living the dream! The only thing we lack is the last one--to send Vito to good schools. In today's fiercely competitive world, good isn't enough, though. We have to send him to the best. And that's going to cost us money. Lots of it. That pretty girl in the middle is Doerie Caraca. She's 14 years old. She's also lost her father. He died in 2008, the same year my Mama died. He was an OFW and the family's breadwinner so I can imagine how frightening it must've been for his wife and two daughters. But because Mr. Caraca prepared for the worst and got Deorie and her sister, Ginger, Philam Life's Scholar Gold educational plans, his family is taken care of and his daughters are continuing their education, and are even at the top of their class! Vince and I want that same protection for our Vito. Not just for his education but for his life, in case the worst happens (please don't let that be so, dear God!). So very soon, we'll be getting Vito a good policy to ensure his education and, if we still have the budget for it, we're exploring investing! 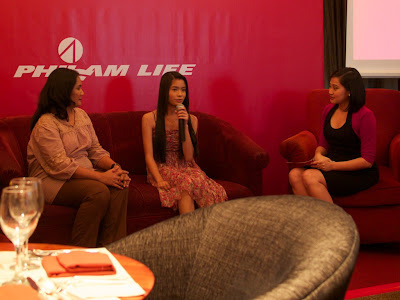 So I really had an interesting afternoon learning about financial freedom with Philam Life. I'm really excited to prepare for our future because once tomorrow is taken care of, then you can really live today! Hmm. I should copyright that sentence! Deorie’s story is just one of the many lives changed by Philam Life’s plans. If you too are a Philam Life policyholder or beneficiary and your plan was able to help you achieve your dreams and protect those you love, do share your story on www.anongplanomo.com.ph. You might even get a chance to win an iPad 2 and more! If you're interested in financial planning and how to make your dreams come true, you can check out Philam Life's website at www.philamlife.com or call (02) 528-2000. I really enjoy reading your honest blog posts about money. I have a lot of money issues as well (I'm in debt, I feel like I'm not making enough, etc), so it's really inspiring for me to read about how you overcame yours with hard work and smart planning. Sadly, a lot of people live by a hand-to-mouth mentality, which gets many of us into a lot of trouble when, well, trouble comes knocking. Financial illiteracy is a growing epidemic in our country; ironic, since our culture NEEDS the boost! We need to see that preparing for emergencies and investing in the future isn't about being paranoid or having a fear mentality; rather, it's about by making wise choices in the present time so we can reap the benefits in the future. I learned this from my dad! I think it's important to teach children as early as possible about saving. It's important to educate teens about investing mutual funds at a young age so that they reap more benefits in the future. Your little one is lucky because you and Vince are super responsible financially; Vito will be, too! Uh, ok, I'm sounding like my dad. LOL. Hi Frances! I'm glad you wrote something about this. As mothers, we only want the best for our kids. I agree with Martine and I think it's our culture that's the culprit. We are not a savings-oriented society and parents would rather save up on their children's education and needs rather than acquiring their own homes or securing their financial needs. Financial literacy must be given a boost and the government must encourage insurance across all sectors. Ako talagang insurance-conscious, gee I had my first insurance policy when I was 21 (when I got my first job) and to date dami ko na yata hawak haha! AJ too learned to save up for his own future through me. We definitely don't want to be a burden to our future children. Great post! Makes me think on investing in an insurance plan soon. So sad I wasn't able to attend this one 'cos 'twas hubby and I's anniversary. :/ Thanks for posting! Like the others who commented before me, I too enjoy reading your posts on money matters. I don't consider myself money-smart as of yet, but hopefully I'm on my way there. I just got myself a life insurance plan and I'm also beginning to invest. The problem is I still find it hard to resist my shopaholic tendencies! It's really an ordeal for me to let pass something I really like. Your posts keep me motivated, I hope you make more of these! Thanks. Which reminds me that I have to check on my insurance plans and find out about endowments. Kaso, I'm with the other insurance company. hehe. Dea, I was in debt, too, until I was 30! When Vince and I got married, that was the first thing he fixed--my debts. He didn't pay them; he made me pay them! It was so painful! I almost thought we'd break up because it was so embarrassing! Martine, it was Vince who taught me about saving actually. I learned very bad money habits from my parents. It was very difficult to unlearn them! Leadeleon, thank goodness AJ married you! =D Me naman it's thank goodnes I married Vince! Kasi if I didn't, malamang baon pa rin ako sa utang ngayon and walang pera! Frances, you have to share with me your insurance plans. I have a life insurance plan from Philam actually that I've already paid off but I have to find out if I have benefits from it that I should be getting. Thinking of getting health / retirement. Anyway, when we meet up I will grill you! Anyway. I'm chalking your post to another sign that I really should get an insurance policy already, while I'm still young and single. I keep seeing signs. LOL. I'm lucky enough to enjoy an incredibly comprehensive medical insurance because of my job, and that I get to enroll my parents and my sibling. 1K per payday is a very good price to pay for that peace of mind. But I do want to extend that to different aspects of my life too, not just medical. A friend of mine even told me that certain insurance policies can even help you out should you be unexpectedly unemployed. It's really not just about medical stuff and death. Plus I don't want to be a burden to my parents if ever I stop earning my own money, even for a little while. you know i dont want to end up broke when i get older that's why im making it a point to save this year and clear out my debts. your financial posts are inspiring frances. Am really glad that more insurance companies are embracing the advocacy to teach us on how to manage our finances. If I have not worked with Sun Life, I wouldn't know what would be of my money. This is my favorite post so far I think. You may have inspired me to actually get insurance already for my little family, especially Jacob's education. Who knows how much college tuition will be by the time they're freshmen? Nanghihina na ako just thinking about it. I will research on what insurance company is best for us. Thanks for the enlightenment! Thanks for this post, Frances. I'm still deciding whether I should get educational plans from insurance companies or from banks. Must talk to an agent from Philam Life.